Tired of bowling as the only after work activity? Or tired of training at Friskis & Svettis this year as well? We offer custom solutions for companies outside of our regular open hours! Fitness training with work is growing, more and more employers with Google up front is recognising the winnings with it. 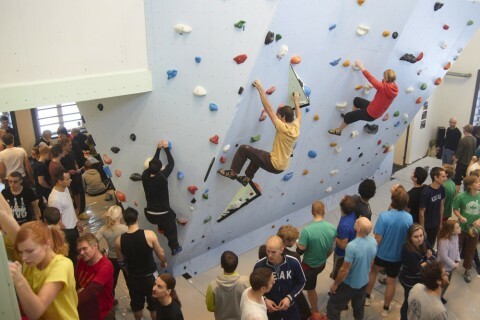 At Örebro Klättergym you get a physical activity that is extremly motivating and fun. It can range from just a one time visit to a regular thing where you rent the gym on a fixed time every week. On fridays and saturdays we close at 6pm and after that there is a possibility for companies or other groups to visit us and have the entire gym for your self. We can arrange with food and drinks after your demands. You decide what concept you want!